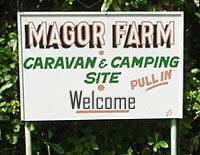 Welcome to Magor Farm Campsite in Tehidy just on the outskirts of Camborne in Corwall. We welcome caravans, tourers and tents to our quiet, tree-lined field situated just below Magor Farm, farmed by our family since the 50's. The quiet hamlet of Tehidy makes an ideal base for holidaymakers, surfers and walkers exploring the south west of Cornwall, with its fantastic coves, unspoilt sandy beaches, and breathtaking coastline. We are a few minutes away from the National Trust beach of Godrevy and its famous lighthouse. The tranquil setting of Magor Farm campsite has hardly changed since we started taking campers in our bottom field in the the mid 60's - apart from the installation of hook-up points down one side of the field. This un-spoilt site has been loved by many a family who return year after year. Indeed, when some book, they ask if we have changed anything because they like it just the way it is! From the moment you arrive at Magor Farm Camp Site, you will experience and enjoy the calm, laid-back atmosphere. In fact, you won't even find a reception office - just pitch your tent, park your caravan, and start your holiday. We will find you either that evening, or perhaps in the morning when we do our rounds. You see, it's as simple as that! However, to avoid disappointment, and to book a hook-up, we suggest that you contact us prior to your arrival. Mr. & Mrs. Kelvin Williams. "This is a pleasant and pretty site. Long and tree-lined with hook-ups down part of one side. There is no reception, so just pitch up where you can find a space. Mr. Williams, the site owner comes around regularly in his car (generally mornings and evenings) to see you. There is a simple playground, with swings, seesaw and roundabout. The facilities are basic but adequate. Showers are free. They are reminiscent of the 50s, with green painted woodwork and cream walls. It is ideally situated for exploring the superb National Trust beaches and coastline on the north of the peninsular, and equally, for visiting, Hayle, Penzance, Newlyn and Mousehole on the south. Also, right next to the excellent Tehidy Country Park. We stayed for one week with another family, and thoroughly enjoyed our stay.